Luke Skywalker: But what if this Obi-Wan comes looking for him? Uncle Owen: He won't. I don't think he exists anymore. He died about the same time as your father. Luke Skywalker: He knew my father? Uncle Owen: I told you to forget it. According to the (canon) Star Wars: From a Certain Point of View short story Beru Whitesun Lars, Owen and Beru were fully aware of Luke's parentage and the fact that his father had become corrupted by the dark side of the Force. But it turns out when someone puts a sweet little newborn into your arms, you can’t say no—even if that baby is your husband’s nephew by his stepbrother who’s embraced the dark side. You know things may not turn out well, but just like with blue-milk cheese, you do the best you can with it. And it turned out to be the best decision I ever made. Luke was such a sweet, happy little boy. He was no trouble at all. Not to say he wasn’t mischievous, always getting into one scrape or another. But he didn’t have a mean bone in his body—unlike a certain someone I could mention (all right, fine. I’ll mention him: I mean his father). 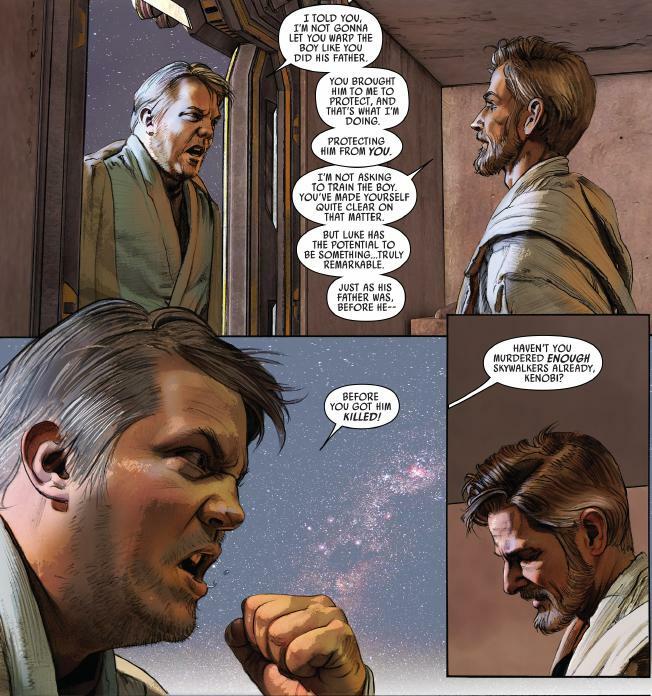 Interestingly this seems to conflict with the Star Wars Marvel comic (also considered to be a canon source of information about the Star Wars universe) in which Owen appears to know only the publicly available story about Anakin's death, that he died defending the Jedi Temple from over-eager clone troopers after the Jedi Coup against the Chancellor. From the said conversation in Episode 4 and what we know of Episodes 1-3 we know that Owen and Beru know that Anakin is a Jedi. Or more was. What is more is that the Jedi were officially discredited and executed in Episode 3. When Owen met Anakin that one went off to find his mother (who was Owens step mother) and rescue her alone from a place where not even a full group of armed men managed to get her from and succeeded easily, bringing her back dead though. What they know of the Jedi is most likely whatever the Senate put out there in addition from what they saw from Anakin. They know that the Jedi are fugitives and if Luke comes even remotely after his father he will be a fugitive and more so he will move out of their lives forever. As both Beru and Owen are very fond of Luke and don't want him out of their lives they have a dislike for that; especially Owen who probably didn't even forgive Luke's father for leaving the boy alone. If Owen knows that Darth Vader is Anakin the chances are.....low, very low. First off when Ben brought the baby he thought Anakin was dead. Probably later on he learned the truth though BUT admitting it or not he is VERY ashamed of what happened to his former pupil at that time. One can see it quite clearly in episode 3 that he is hurt and ashamed at the same time. About what happened to his pupil and of his failure to teach him correctly, so that this all could have been avoided. With that in mind it is very unlikely that months or years after he came to Owen and said "Oh and the gruesome executor the Emperor has.....is Luke's father". Even taken from the non-emotional Jedi perspective it wouldn't have made much sense as in the worst case it would have made Owen unsure if it was wise/safe to still keep the baby with them or not. And wouldn't have served any further purpose there aside from that. So very unlikely. has too much of his father in him. It's very unlikely that either Owen or Beru knew about that. If they did know, then Beru's statement seems remarkably...ghoulish. Listen to the way she says "He has too much of his father in him." Her statement is light-hearted, flippant, and cheerful. She's almost chuckling as she says it. correctly states that Beru probably doesn't know the complete fate of Anakin - however, I disagree that Owen also doesn't know. His response to her is much more grim and at the same time elusive, somewhat implying that he knows more than he's letting on. It's quite possible that Obi-Wan told him everything, but to never tell anyone else, including Beru. However, this is fully speculative. Bear in mind, they originally met Anakin in the prequel era (Episode II, to be precise) and Anakin's mother was Owen's stepmother before she was abducted by the Tusken Raiders. It's entirely possible that she told them all about how he was being trained as a Jedi, etc. Then to have him show up in full Jedi robes only to blast off into the desert and slaughter a tribe of Tusken Raiders, bury his mother, then leave again on another adventure probably didn't make a great first impression on either Owen or Beru. If this is all Beru knows about Anakin, her flippant tone in the exchange above is justified. He comes off as a reckless adventurer with a slight dark side (remember, they all seem consider the Tusken Raiders to be beneath them). However, while we can surmise that they both know Luke's parentage, and we can infer that Beru does not know the full story, we must concede that we just don't know how much Owen knows about Anakin and Vader. Any further discussion would be pure speculation. It's fairly clear that Beru & Owen know that Luke is Anakin's son, as they met Anakin and Obi-Wan brought Luke to them. It's fairly easy to connect the dots there. However, what's ambiguous is what they know about Anakin - i.e. if they know that Anakin became Darth Vader. I doubt that Obi-Wan told them that information, as it would make it possible for Luke to find out prematurely (i.e. if they spilled the beans, even if it wasn't on purpose) which might lead to a Kylo Ren situation - Luke seeking out his father and wanting to be like him. I believe that it's certainly possible, based on the ambiguous dialogue in Episode IV - specifically the bit about Luke having "too much of his father in him" - that they knew Luke's father was a Jedi (and that Obi-Wan was his teacher), but merely think that Anakin died in the clone wars or the Jedi purge. In hindsight, from the viewer's knowledge that Anakin is Darth Vader, we might assume the bit about "too much of his father in him" might mean that Owen and Beru are referring to the fact that he could turn to the dark side and be dangerous. But they also are people who specifically stayed on the farm and didn't "get involved." They might be referring to the idea that Luke will run off and get himself killed, as they believe his father did. Not the answer you're looking for? Browse other questions tagged star-wars a-new-hope luke-skywalker anakin-skywalker or ask your own question. When/How does the Empire say Anakin Skywalker died? Did Luke know the “Chosen One” prophecy? Was it intentional that Luke and Darth Vader did not meet during A New Hope?